Spain was shaking in its boots after Monday’s earthquake, Joe Duggan does a little digging to find out if Mother Nature could strike again? I KNEW immediately what was causing my five-storey block of flats to sway. Not the wind. And certainly not the amorous endeavours of energetic neighbours. Turning to Twitter after this rude awakening, I saw that the same reverberations pulsing through my bedroom had been felt by people from Cadiz to Granada and as far inland as Sevilla. Minutes later a second, less-powerful tremor coursed across the walls. I met my flatmate in the hallway. And he’s Estepona born and bred. We laughed nervously. But as I crept back to bed, Spain suddenly felt a lot less safe. At 5.22am on Monday, January 25, the earth moved for thousands in Spain and didn’t stop for 12 seconds. According to the U.S. Geological Survey, seven large tremors struck in the Alboran Sea, the first and most powerful registering magnitude 6.1. Following this, Spain’s National Geographic Institute estimated the quake at 6.3. Spain’s north African enclave Melilla was worst-hit, with one 12-year-old boy suffering a fatal heart attack and at least 26 people injured. Three days earlier, a quake of magnitude 5.1 shook the same area. So what makes the region susceptible to such regular tremors? Southern Spain is not subject to the planetary convulsions that have laid waste to parts of Japan or Chile. But the convergence of the African and Eurasian tectonic plates means the Mediterranean seabed is seismically active. As a result, each year the Iberian peninsula experiences 1,200-1,400 tremors, most too small to be felt. January’s quake was the biggest to hit for half a century, but the Iberian peninsula’s deadliest in recent times occurred in May 2011, when 11 people were killed and more than 400 injured in the Murcian town of Lorca. The Lorca tremor was of lower magnitude at 5.1, but it struck at a depth of just 3km. This month’s struck at 33km below sea level, caused by the movement of tectonic plates along the strike-slip fault crossing the Alboran Sea from Cabo de Gato to Al Hoceima in Morocco. That’s the same kind of fault as California’s San Andreas, although this one, the Trans Alboran Shear Zone just off the Costa del Sol, is not known to have produced anything over a magnitude of 6.3. Although the aftershocks following this year’s quake caused a degree of panic among the public, experts weren’t alarmed or surprised. And seismologist Marc-André Gutscher explains that another similar-sized quake is unlikely to hit any time soon. If it did, he says, it would most likely be 10-40km north of Al Hoceima. “Alternatively the next segment north, adjacent to Alboran Island (90km from Almeria), might produce an earthquake of comparable magnitude. “We have had earthquakes like this throughout history,” Juan Vicente Cantavella, a seismologist at Spain’s National Geographic Institute, told the Olive Press. “When there is a lot of energy released, like in January’s earthquake, it is very unusual to have another of the same size. Nevertheless, there are those who are unhappy about the measures Spain’s authorities are adopting to guard against further problems. Following the Lorca tragedy, Luis Suarez, President of Spain’s Ilustre Colegio Oficial de Geólogos (ICOG), sent a list of 10 recommendations to central government and the autonomous regions to improve safety. The majority have not been adopted, which Suarez labels a ‘disgrace’. “It’s much to our grief that they haven’t been implemented,” he said. “This isn’t California, Chile or Japan but you have to bear in mind there is a risk. The southern Iberian peninsula has certainly felt the brutal power of Mother Nature in the past. On Christmas Day, 1884, some 839 Spaniards perished when an earthquake hit the town of Durcal in Granada. But the worst of all struck 129 years earlier – a quake estimated to have measured between 8.5 and 9 on the Richter scale. Under the Straits of Gibraltar there is a unique subduction zone, a zone in which which one tectonic plate moves beneath another with the potential to cause powerful earthquakes. Although debate still rages among seismologists, it is believed that it was a subduction zone beneath the Gulf of Cadiz and Gibraltar which, In 1755, caused Europe’s deadliest earthquake. The Great Lisbon Earthquake, as it was called, killed up to 60,000 people in Portugal, Spain and Morocco, triggering a 15-metre-high tsunami that destroyed the Portuguese capital and engulfed parts of Cadiz and Huelva. ‘The size of the unique subduction zone of Gibraltar is very small and its movement is very slow’, wrote Gutscher in a paper that appeared in the earth science magazine, Eos. ‘It is probably the narrowest subduction zone in the world, at 120 miles wide, and it is moving less than a centimetre each year’. Thankfully, this snail-like pace means any chance of a similarly brutal quake ripping along the southern Spanish coast in the near future is highly unlikely. “Given the very slow motion of the faults in the area,you need many centuries to build up enough slip to generate such a great earthquake,” explained Gutscher. So we are safe from another big one. For now. NINE people died, including a pregnant women and a child, when the town of 90,000 people was ravaged by a 5.2 magnitude earthquake. 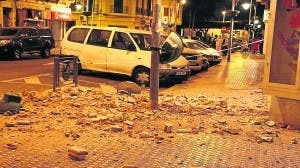 Some 324 people were injured and around 20,000 buildings destroyed while tremors were felt 350 km away in Madrid. A QUAKE of 4.7 magnitude razed 800 buildings to the ground and left dozens of families homeless on January 29. Although nobody was killed, 500 aftershocks caused panic in the days afterwards and locals endured 35 quakes in that year alone. A DOZEN people lost their lives, 70 were injured and 500 buildings were destroyed in Albolote, Atarfe and Granada when this factor five quake broke. 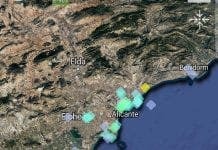 UNTIL 2016, this 7 magnitude quake had been the most powerful to strike Malaga in the past 50 years. It’s epicentre was 650 km below the town of Durcal and its great depth meant nobody was killed. ON Christmas Day, a 6.5 magnitude quake laid waste to part of Granada province, taking just 10 seconds to kill around 839 people. Over 4,400 buildings were destroyed and 13,000 more damaged. THIS now popular tourist town which lies on the Bajo Segura fault line was levelled on May 21, 1829, with 389 people killed, 375 injured and 2,000 homes destroyed. EUROPE’S worst earthquake wiped out 60,000 people on All Saints Day. Many churchgoers were killed in the disaster, which saw a 15-metre-high tsunami engulfing Lisbon, Cadiz and Huelva. An earthquake of magnitude 8.5 or 9 is pretty much out of the question since this happened 250 years ago – 250 years in geological terms is’nt even the blink of an eye – howling with laughter. For those who don’t know – we are living in a major geological event period right now, just check out all the Tsunamis and earthquakes that have happened and are happening right now. Don’t be scared just be prepared to know what to do – staying inside a house or especially an apartment building where no thought let alone attempt to design earthquake resistance is made – rather you than me. I was a teenager living in Rota Spain when the horrific 1960 earthquake killed 1/3 of Agadir’s population (12,000 people). My best friend’s mother’s entire family was destroyed by that earthquake. I still have a surviving vase that my friend gave me that came from the ruins of their family home. I was a teenager living in Rota Spain when the 1960 Agadir earthquake killed 1/3 of its population (12,000 people). My best friend’s mother’s family was destroyed by that earthquake in Agadir Morocco. I still have a small vase that my friend’s mother gave our family- one small memento from a horrific earthquake.